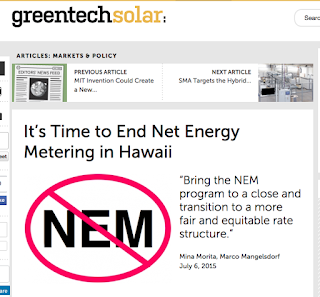 Marco Mangelsdorf and I co-penned an opinion piece on net-energy metering which was published by GreenTech Media this morning. Click here for the entire article. The total lost contribution to fixed cost for the HECO Companies has increased from an estimated $19 million based on installed NEM capacity at the of 2012, to $38 million at the end of 2013 and to an annualized $53 million at the end of 2014. This is the estimated cost-shift to the non-PV ratepayer. For the tax year 2012 alone the renewable energy income tax credit accounted for 48.41% (total $179,018,000) of all state tax credits ($369,811,000) claimed. Currently, the information for tax year 2013 are not publicly available but PV installation growth indicate nothing different, ditto for tax year 2014. This has a significant impact on all programs that receive their funding from the State's General Fund. 2. Electricity has different values at different times of day. 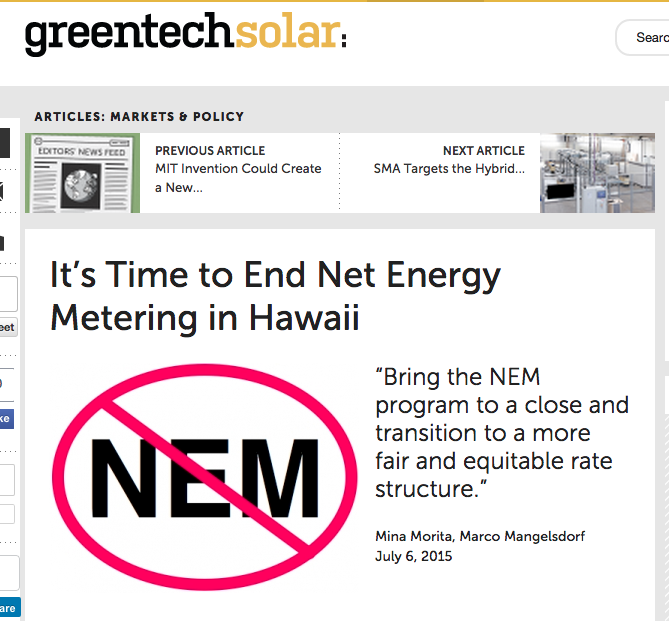 By instituting time of day pricing along w/ reform 1, NEM will be paying PV supplying households a more correct price during their surplus hours. 3. Solar panels are highly subsidized. Remove the State tax credit and liberate Hawaii taxpayers. 4. Many observers also criticize NEM on the grounds that it compensates distributed suppliers on the basis of retail rates instead of wholesale rates. When rates are set according to marginal cost, this is not a problem however.